Alex Stuart Quntet | OK Listen! Australian guitarist Alex Stuart moved to Paris in 2005 where he continues to live. His first album Waves was recorded in Sydney in 2005 with some of the cream of the Australian jazz scene. In October 2010, his quartet released the very successful album Around ("Révélation Jazz Magazine/Jazzman") featuring French jazz star Guillaume Perret. 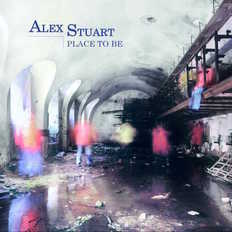 His new album Place to Be has been released to critical acclaim (see above). In 2013, Stuart was nominated for the Freedman Fellowship (prize for the best young talents of Australian jazz). Stuart plays and has played with Groove Stance, Alula, Black Sesame, Tulika Srivastava, Alex Stuart/Warren Walker Band, NewElectroSoulSession, TANG!, Abakuya, Guillaume Perret, Nicolas Folmer, Jérome Regard, Moira Conrath, Julien Wilson, Brice Wassy, Bruno Angelini, Munir Hossn, Remi Vignolo, Luc Isenmann, Miroslav Bukovsky, Eric Ajaye, Chris Cody, Dave Panichi and Alex Jacquemin.